Robert Broderson was born July 6, 1920 in West Haven, Connecticut. He died in Independence, Virginia on March 12, 1992. He began painting as an older student attending Duke University on the G.I. Bill after World War II. After he graduated from Duke in 1950, he continued painting and studied printmaking with Mauricio Lasansky at the State University of Iowa, where he received an M.F.A. in 1952. 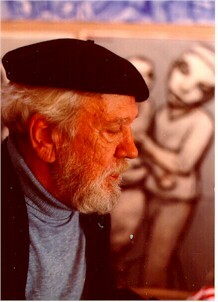 Broderson then returned to Duke where he taught classes in drawing and painting for twelve years and became an Associate Professor of Art. He left Duke in 1964 after receiving a Guggenheim Fellowship. Broderson also taught at North Carolina State in Raleigh in 1967-68, and at the Skowhegan School of Painting and Sculpture in Maine during the summer of 1967. After the sixties, Broderson gave up teaching and devoted all his life to painting. 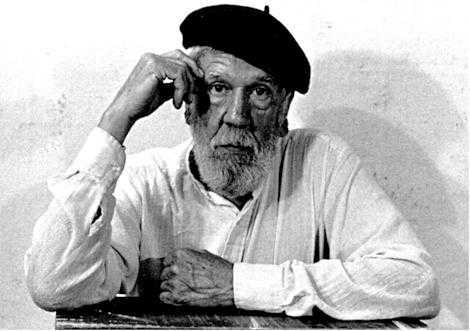 Broderson was a figurative painter, concerned with human and other figures. His subjects, as he said, "always tend more toward the imaginative than the real." The people in his paintings are not real people; the landscapes do not exist in nature. Corcoran Art Gallery, Washington, D.C. I am certain I am not of this earth. I was a child of God, a spirit sent to earth to join a body. I knew the seasons and the heavens. As a child I loved my mother, feared my father, chased grasshoppers, killed snakes, and ran naked through the woods. The east winds blew across the west river, carrying the odor of the mud flats. I sat in the shadow of the stiles and fished for kelleys, transfigured by the swirls and eddies of the inland tide. I felt the heartbeat of the salt marshes and ran with the darkness home. I sometimes wonder if Im really a painter. Ive been doing that now for 45 years, so I guess thats the answer. Anything I say about my own work to heighten your awareness will naturally be biased and perhaps blind, since I cannot stand outside either my paintings or myself. Once I start painting that sort of scratches everything else, and the painting becomes itself. It becomes what it will. So it is no longer necessary to measure up to some image I thought I was going to describe. Ive always felt safer when I deal in a fantasy world, just starting a canvas and doing something with it, making something start to happen. I dont feel Im responsible to anyone around that; whereas if I do a portrait, Im in some way responsible. My work has engendered both hostility and indifference, anger and fear. It has been described, variously, as grotesque, unhappy, depressing, prophesying doom, and impossible to live with. Seldom has it been seen as tender, compassionate, humorous or beautiful, and never, as I see it, understood. In a very real sense my art is my autobiography, and my very life is reflected there. In judging the artist-- his strengths, weaknesses, greatness or slightness, eternal or temporal qualities-- words will have no bearing. It is clear that a work of art must stand by itself. Ive certainly looked at a lot of other painters work in my life, and I certainly have tried to paint paintings like other painters whose work was beautiful. You see the first Cezanne and think, "Oh Christ, if I could only paint something that beautiful-- a still life or that "Boy Leading a Horse," or something. Thats what I wanted. I wanted to make something as beautiful as that. Thats my main drive. Castenada says, "eternity is now." Hes probably right. It is the nature of creativity that the artist must be tormented by doubt and never know with certainty that his work, once born, will continue to live. He must be forever blind. Having said all that, now I tell you I am a painter, and in this pursuit lies my ultimate value, meaning, and measure. To be a child again, a mixed blessing. For in these late years there are times when I should fight to receive the attention my work deserves. Instead, I often feel indifference. It is more fun to play than to worry about such matters. I would rather shut myself in my studio and paint. No matter how far I am pulled by other forces outside myself, I must always return. I have been the professor and the lover, the sufferer and the pimp, the whore and the beggar, the songster and the traveler, all this and more. And yet, I am, at heart, home within myself and the secret that I cannot fathom, that curse and that blessing that was placed in my hands, a bond within me, the origin of which I little understand but must accept, to be a painter. How strange to be thrown into existence, and then live to wonder how and why. Dont be afraid of the paintings. They cannot hurt you, for at best they may change your way of viewing things, if you are open, and at worst, send you back to the safe world you already know. But I must tell you, change is the only true meaning of existence. I think its all such a mystery, the whole thing of life and being a painter. I dont know any more about it today than I did when I started. Ive done this slight time of painting. What it means, why it really came about, why the images evolved the way they did, I really dont know. Why not speak openly. There is an overwhelming sadness and poignancy to existence. I do not have the capacity to lose my grief through tears. I suppose in some real sense, it thus finds its way into my work. All that should interest you is what has lived, what is living, and what shall continue to live. And what does my work express? A little joy, a lot of pain, and many unanswered questions. If there is a specific message, it is this. We are intimately bound and ultimately alone. To see the Broderson studio and the paintings, E-mail below.